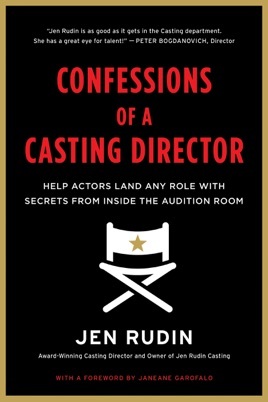 Confessions of a Casting Director is a must-have for any aspiring actor or stage parent—the definitive guide to breaking into film, television, theater, and even YouTube from longtime casting director and studio executive Jen Rudin. Packed with information that aspiring actors want, her up-to-the-minute expert advice is essential for anyone pursuing an acting career. Jen Rudin demystifies the often intimidating and constantly changing audition process, sharing insider tips on preparing for every type of audition: musical theater, television (including commercials and reality TV), and film to voiceovers, animated movies, and even web series. In this comprehensive guide, Rudin covers everything today’s actor needs to succeed, including finding an agent or manager; using technology to your advantage; the demanding world of child acting; the pros and cons of New York vs. LA; turning a callback into an offer for the role, and much more. Every actor should walk into an audition room feeling confident and prepared, and this book is full of the Dos and Don’ts, sure-fire tricks, and must-have information to help turn rejection into that first big break. Complete with checklists, easy-to-follow game plans, and advice from real actors, agents, and entertainment industry professionals, Confessions of a Casting Director is like having your own private audition coach.